The Hopi have an oral, not a written tradition. 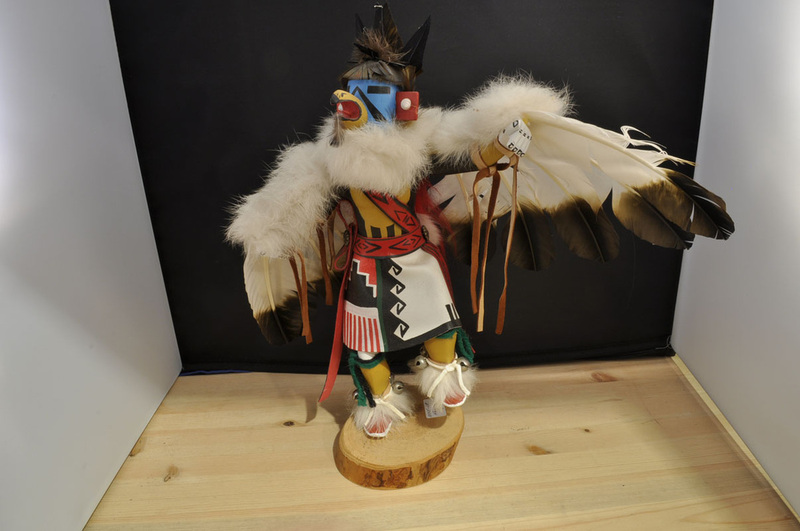 Their culture is passed from generation to generation through story telling, and it is the Kachina Doll which acts as the memory aid for the story telling. From passing down religious theology to historic events, to explaining the natural environment or the tribes code of conduct, the Kachina doll represents a deity which embodies the idea which is to be passed to the next generation. The older dolls which date before 1940 are particularly collectible on today's market. The one at right is an early example: note the short legs, arms tight to the body and overall proportions. Rare, older dolls are typically priced between $1500-6500. 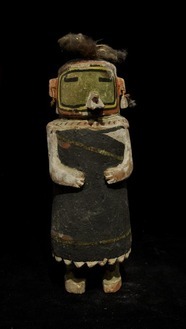 Example of an older Hopi Kachina doll. 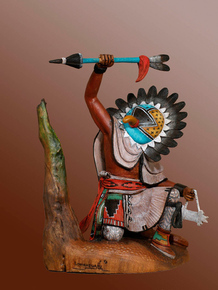 Contemporary Hopi Kachina dolls of high quality tend to be very realistic and collectors prize detail and motion, and, as some carvers are becoming very famous, the demand for a "top carver's doll" can drive the market. The Navajo do not have a Kachina religion nor are Kachinas used in their culture, yet, due to market demands, they do make a lot of dolls which resemble Hopi dolls. Collectors consider them simply a decorative item and consequently they are mostly very modestly priced (or should be). Most Navajo dolls are made of heavier pine (not cottonwood root), and are usually brightly painted and with lots of feathers and fur. As they are more quickly made, they are usually priced from $25-200. Looking to sell your Hopi Kachina doll carvings? Let us make you an offer! Click HERE for more information.